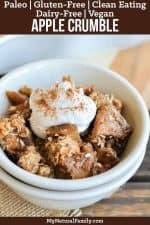 This Paleo apple crumble is a fantastic way to use all the abundant apples at harvest time and is such a fast and easy way to enjoy apples. Plus, using coconut sugar as the sweetener not only tastes good, but it’s much easier for your body to digest than traditional sweeteners. If you haven’t tried coconut sugar before, I highly recommend it! I can no longer allow my kids to watch morning shows until 9 am while I get things done – or while I enjoy my breakfast in the dining room alone. Now I have to get up, get the kids showered and dressed, and be out the door by 8:45 am, which probably doesn’t seem too early to most of you, but we are NOT morning people in this house. None of us are, so 8:45 am is early for us. Anyway, the other day, my mom called and asked if she could submit a recipe request. I immediately said YES, I love getting recipe requests – so if you have any please send them my way. 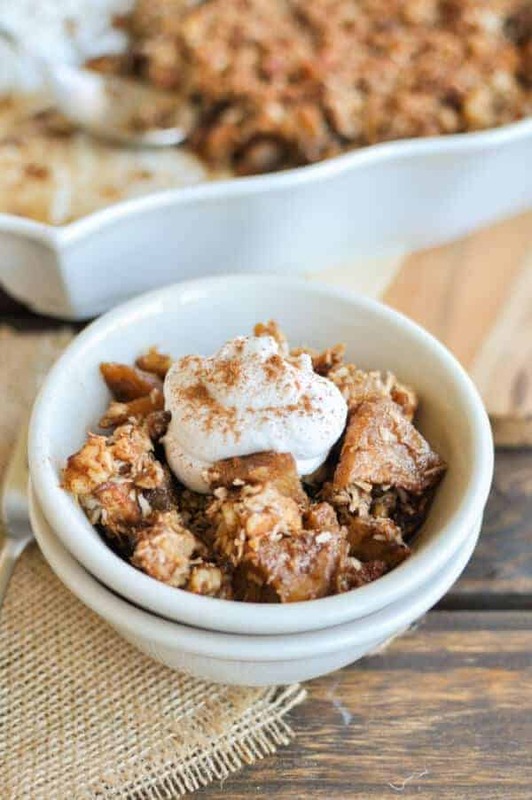 She asked if I could make her a Paleo apple crumble since it was apple season. What a great idea! And she was right – apples and back-to-school go together like peas and carrots (as the saying goes)! Plus, here in Utah there are apple orchards all over and we can go to stands on the side of the road and buy apples and they are way, way better than apples you can buy in the store. They don’t even compare at all. And one of the stands is often open until February. And don’t even get me started on the fresh apple cider they have. Amazing! We buy apples by the box and have so much fun trying all sorts of varieties we’ve never heard of before. We also love to go to “The Red Barn” a little later in the fall and go on a tractor ride out the corn maze, tractor bikes, huge slide, sandbox, apple cannons, pumpkin patch and a bunch of other stuff I can’t remember right now. So the other day after coming home with a box of Sonya apples, I started doing a little bit of experimenting. 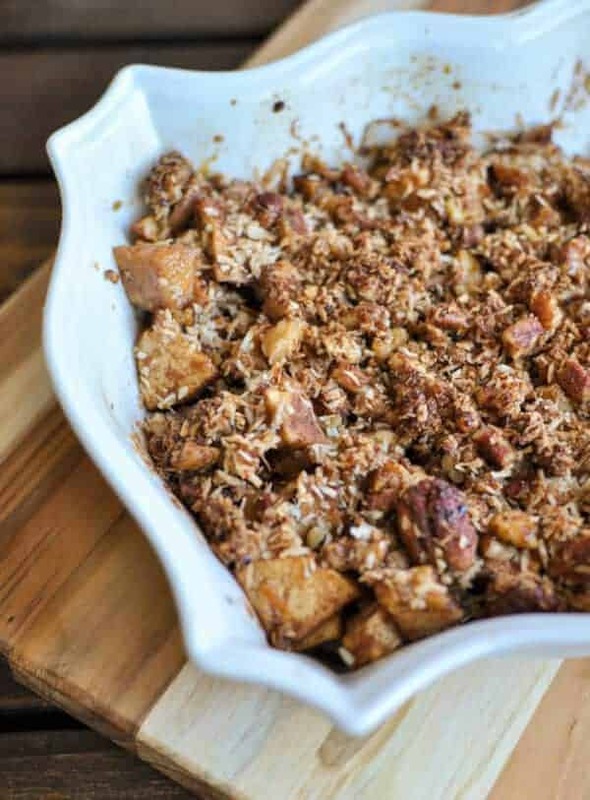 I came up with this delicious Paleo apple crumble recipe that is made without refined sugar and is Vegan and Paleo friendly…Plus, all the people that taste tested it LOVED it, so it is safe to take to a family gathering or serve to a crowd. I don’t know about you, but I love bringing my own healthy desserts to big gatherings, then I feel like I can indulge with the rest of the crowd. I highly recommend whipping up a batch asap – you won’t regret it – promise! 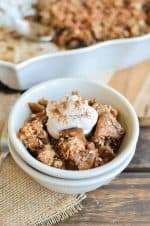 I would love to know if you try this recipe, so please comment below and let me know what you think! 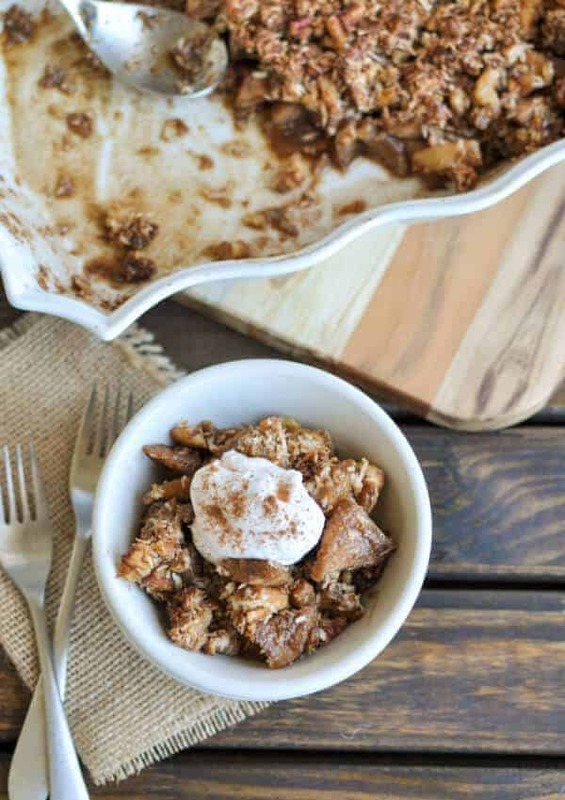 This Paleo apple crumble is a healthy dessert made without refined sugar and is easy to make with a simple pecan and walnut topping. The apple crisp was yummy and healthy too. Loved it!